The facade of this home contains key design elements of the traditionally small bungalow style, including the curved gable, dormer, and arched doorway. Inside, this 2,527-square-foot home is anything but small. A 318-square-foot great-room with fireplace and built-ins dominates the main level. The great-room opens to the gallery, which connects the two wings of the home. The kitchen includes wraparound counters and a raised serving counter and is open to a dining area with French door onto a rear patio. A formal dining room is set into the bay window at the right front of the house. The big master suite with bifurcated walk-in closet and big master bath, is set behind the two-car garage. The upper level contains three secondary bedrooms; two share a bath while the third is a self-contained suite that could be used as a guest suite, in-law suite, or a suite for a teenager. Question: 1. What is the heated square footage? 2. 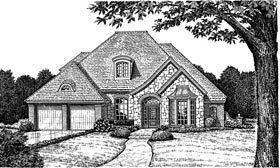 What is the architectural style of this house plan? 3. What is the cost for a CADD file for this plan?